For the second time this year, physicists at the Advanced Laser Interferometer Gravitational Waves Observatory (LIGO) are giddy with excitement. They’ve just confirmed the second detection of gravitational waves, ripples in the fabric of spacetime proposed by Albert Einstein a century ago. It seems we’ve officially entered the age of gravitational wave astronomy. In February, LIGO physicists made history when they announced that a large spacetime ripple had swept across their detectors in Livingston, Louisiana and Hanford, Washington on September 14th, 2015. The ripple emanated from the final stages of two merging black holes located 1.3 billion light years away and weighing 29 and 36 solar masses, respectively. LIGO’s second gravitational wave signal came just three months after the first, on December 26th. Again, it’s the result of the spinning dance of a binary black hole pair on the brink of merging, although this duo weighed only 8 and 14 solar masses. When they coalesced at a distance of 1.4 billion light years, they created a black hole 21 times the mass of the sun, while transforming another sun’s worth of mass into a burst of gravitational energy. The discovery was announced this afternoon at a meeting of the American Astronomical Society in San Diego, CA, and has been accepted for publication in Physical Review Letters. When the heaviest objects in our universe slam together in the most powerful collisions, they send shockwaves, not unlike ripples in a pond, emanating across spacetime. Called gravitational waves, these cosmic jitters are incredibly faint, on the order of a billionth the diameter of an atom. But they’re happening around us; offering a window into our universe completely unlike that which we observe via the electromagnetic spectrum. If electromagnetic waves are the universe’s visuals, gravitational waves are its music. That, at least, has been the theory for the past century. But ripples this small require highly precise experiments to detect, and the most advanced experiment on Earth—LIGO, which uses laser beams to measure tiny wobbles in distance between mirrors separated by several kilometres—didn’t have the chops until recently. LIGO first came online in 2002, but turned up nothing definitive for years. Then, following five years of upgrades from 2010 to 2015, LIGO was reborn as Advanced LIGO, which boasted three times the sensitivity of its predecessor. When Advanced LIGO began collecting data last fall, it detected gravitational waves almost immediately. 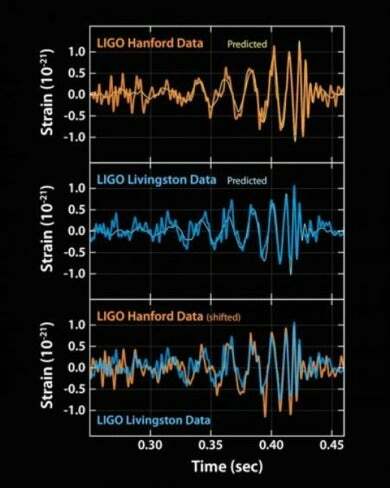 “The first event was huge—it knocked us off our feet,” Shoemaker said, referring to the waveform picked up at LIGO’s twin detectors in Hanford and Livingston in the wee hours of the morning on September 14th. Although trickier to distinguish from the background hum of the Earth, gravitational waves produced by weaker collisions do have one advantage when it comes to detection: they move more slowly. It took the spacetime ripple on December 26th a full second to pass through LIGO’s detectors, as opposed to the previous signal, which coursed through our planet in a fraction of that time. “This is significant because we were able to start describing what was happening during the extraordinary event,” said Federico Ferrini, director of the European Gravitational Observatory (EGO), which hosts VIRGO, a gravitational wave detector located in Italy. In fact, the signal was so stretched out that researchers observed one black hole spinning about the other, making approximately 50 rotations while in the band of LIGO’s detectors. Spin can tell us about an object’s formation history—perhaps this twirling vortex of darkness used to be a neutron star, before consuming matter from its surroundings, gaining angular momentum, and collapsing into a black hole. But we’re going to need to survey many more pairs of black holes in order to fully understand their formation history and dynamics. With just two events, LIGO has already yielded important insights into the size distribution of black holes and the frequency of mergers. Before the first detection, nobody was sure that 30 solar mass black holes even existed. The second event is also rather exceptional compared with the black holes humans have identified via x-ray observations, which are all in the range of several solar masses. Every subsequent event will constrain our theoretical predictions even further. Around the same time, Advanced VIRGO, the EGO’s souped-up detector, is expected to come online with a sensitivity close to that of LIGO. Adding another detector halfway around the world will allow scientists to better localise the source of gravitational waves in the sky. “With three observational points thousands of kilometres apart, triangulation in the sky is much more precise—from a few hundred square degrees to tens of square degrees,” Ferrini said. That means in the future, astronomers might be able to turn their telescopes in the direction of a gravitational wave signal and actually pinpoint the source.